There is a danger, when you start spending real money on good audio equipment, that it’s the beginning of a never ending quest. The quest for the purest, sweetest sound quality, that makes you feel like you're there in front of the stage. For the HI-FI aficionado, that could mean thousands of pounds on the best cables, amps, preamps, transports, DACs and other things that the rest of us don’t even know existed. In fact, despite the march of technology, the rest of us are probably technically miles away from the best possible sound now, even if our kit does look good. The majority of people are perfectly happy with the audio quality from a download or stream from the likes of Spotify and the convenience of portability has won out over the pursuit of the ‘best’ sound. Much to the disdain of Mr and Ms Audiophile, who cling to their CDs and vinyl protectively (well, you have to, it's delicate!). I’m one of those people who is quite happy with Spotify for sound quality, so I’m definitely no audio snob. But I’m also one of those people who knows it’s definitely worth spending a few quid on a nice pair of headphones and not settling for any that were supplied in a box with something else. Where the danger comes from, is once invested in some decent headphones, if you find out that for just a bit more money they can sound even better! And that can be tempting. When I tested the AKG K550s in a HIFI shop, they blew me away! Okay, they’re not the last word in style to look at - but they’re comfortable and the broad soundstage and separation between all the instruments is more convincing than any other pair of headphones at the same price (and they’re much cheaper these days!). My only criticism has been that when connected to a computer or mobile phone, they lack energy at the bottom end without first jacking the volume right up. This isn’t the fault of the AKGs. My weedy laptop and smartphone are not the ideal source for these enormous cans. After all, the laptop’s only other sonic job during my working day is to play the ‘bing’ sound when a new email arrives. That’s all it’s been designed for. At the top of a potentially slippery slope, I decided that I wanted to get the best out of these headphones and that a little more audio investment could be justified. Well, my birthday was coming up, so actually, who needs to justify at all?! 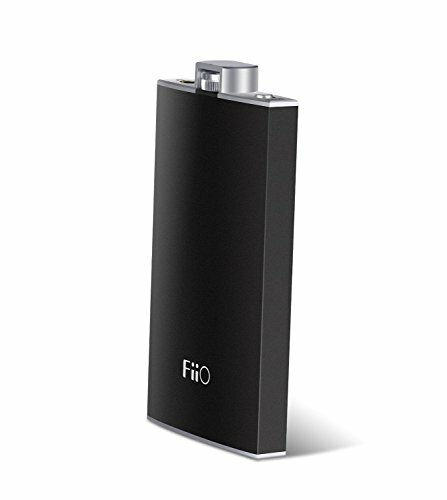 The Fiio Q1 is an interesting little device. Everyone who sees it on your desk will ask you about it. If they don’t, I’m afraid they may have drawn a private conclusion that you’re a drunk. Despite the hip-flask appearance, the Q1 is actually a DAC and headphone amplifier. Essentially, it can replace your computer’s sound-card and provide some much needed oomph to headphones that most need it. At the top, the ‘cap’ is actually the volume dial and turns the unit on and off. Next to it is a bass-boost switch and standard headphone jack. At the base, there is a line in for connection to mp3 players, smartphones and the like, a USB for connection to the computer and a hi-lo gain switch. Finally a charge on/off switch allows you to top up the on-board battery when connected via USB to a computer, or not. Battery life is quoted at 30 hours, so it’ll last a good few journeys away from power. It’s beautifully made with the brushed aluminium at each end and black painted case feeling nice in the hand - but what does it do for the sound? Well, in the case of my AKG K550s, it elevates them to the best headphones I’ve ever stuck on my head. Now, even at low volumes, the bass is coming through and there is just a little warmth across the track to really get the hairs on the back of my neck standing with the right track (my go-to here is always ‘Come Down To Us’ by Burial). The DAC is good enough that I’m even picking out new details in music I already know really well. It also brought the best out in my friend’s Cambridge Audio SE1 in-ear headphones. However, the same experience isn’t guaranteed across all systems. My Sennheiser Momentums didn’t sound much different. Connected to the computer, there was improvement. As I mentioned, a typical laptop’s soundcard is very basic - so the DAC in the Q1 is able to immediately make a difference. But the Momentums have much less need of the amplification - probably having been designed to play nicely with smartphones and computers right from the outset. It was also the same with my friend’s Beyerdynamic Custom One Pro. These have a mechanical switch which can tailor the sound to taste (basically flattening the sound or punching up the bottom end) and he found that the Q1 added very little. So, who is the Q1 for? If you’ve rejected the MP3 and listen to all your music through traditional HIFI equipment, then you have no need for a Q1. But, I can imagine that there are those who like good audio, but accept that streamed music and downloads have their place, particularly at work and on the move. In those circumstances, a Fiio Q1 can boost the sound quality of your computer or smartphone and let you enjoy a pair of traditional HIFI headphones without them sounding underpowered. Give the Fiio Q1 a try, but don’t let it be the beginning of endless refinements to achieve that ‘perfect’ sound.